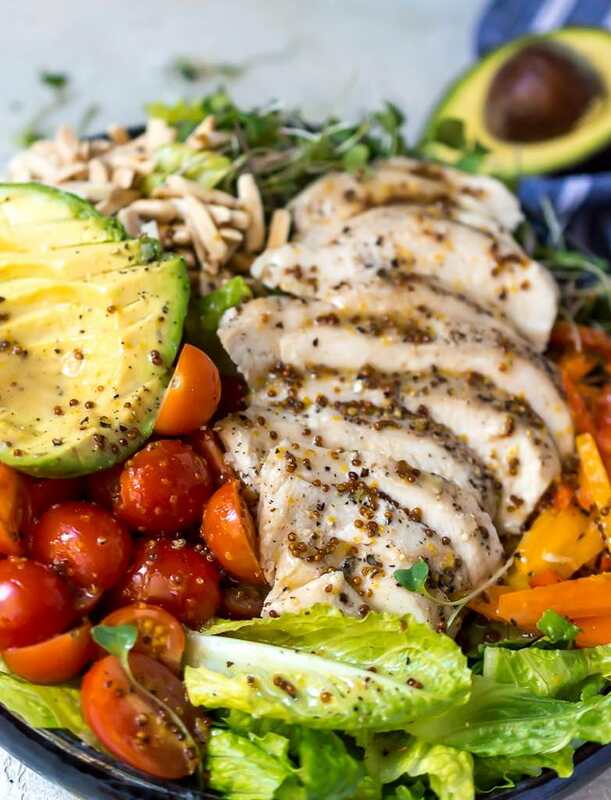 This fresh salad is made into a full meal with roasted chicken, tomatoes, peppers, avocados and almonds. But the Honey Mustard Dressing Recipe is what really brings the flavor! Homemade salad dressing is the way to go if you want to ensure healthy ingredients for your lunch or dinner. This is a Paleo compliant recipe, dairy free, gluten free and grain free. I loved the Honey Mustard Dressing Dip from McDonalds when I was a kid. Yep, I thought chicken nuggets and honey mustard were food heaven 😆 Thankfully my tastes have improved over the years! 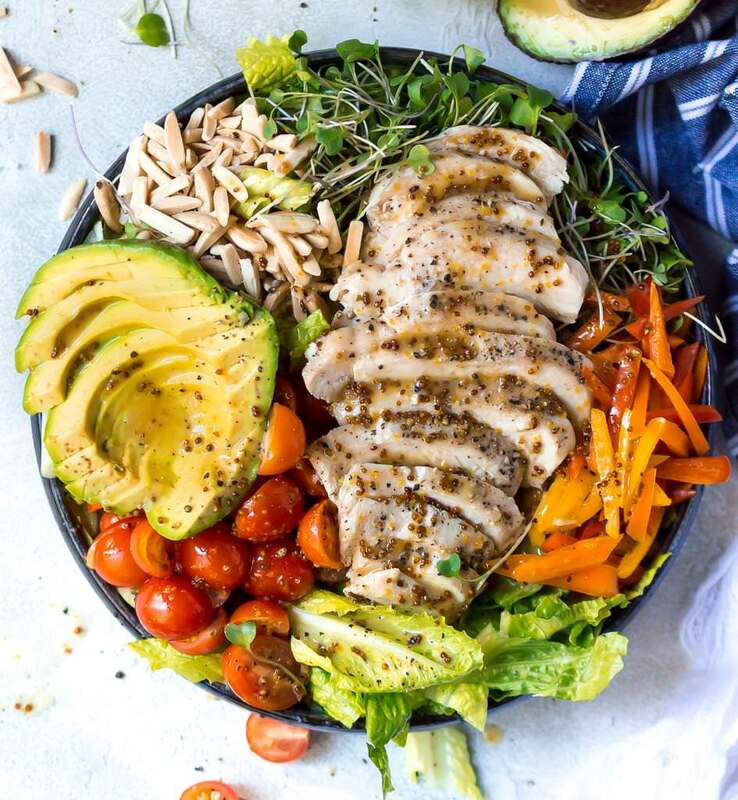 Now I prefer a fresh salad with veggies, grilled or roasted chicken and a homemade honey mustard dressing without any weird, unrecognizable ingredients. I have professed my love for salad and I will continue to do so. There are just so many flavors, combinations and dressing that you could eat a different salad every day of the year if you wanted to. 365 Days of Salad . . . now that is heavenly food! How long before the Honey Mustard Dressing goes bad? I always try to use homemade dressings within 1 week because they don’t have all the chemicals and preservatives. But, within 2 weeks should be fine. 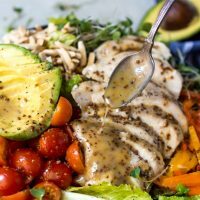 Is honey mustard Paleo compliant? Why yes it is! Check the labels on your mustard and mayo (if store bought) and yes, this is Paleo friendly. Can vegans eat honey mustard? Nope. The honey is an animal 🐝 product and therefore is not vegan friendly. However, you can substitute the honey for maple syrup and opt not to add the mayonnaise . . . then this dressing is vegan. Oh, and obviously the chicken breast will have to go too. You will need a Baking Dish and Meat Thermometer . These Chef’s Foundry Ceramic Knives are great for slicing, cutting and chopping! This Salad is great for meal prep, I use these Glass Meal Prep Containers with Lids . Not a fan of one or more of the salad ingredients? Switch it up. 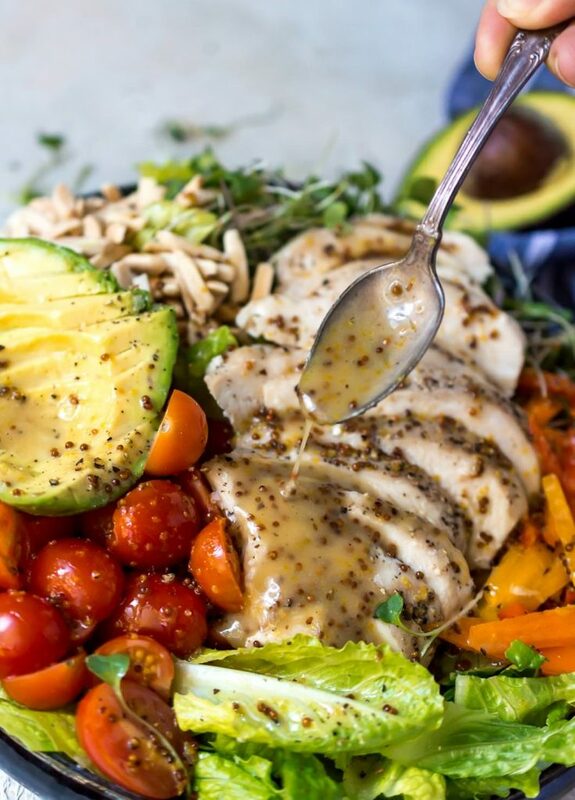 The Honey Mustard Dressing will go with just about everything. Optional add-ins: bacon, onions, celery, cabbage, etc. Make dressing in a shaker or a jar with a lid. Then you just shake, shake, shake until it is blended. For meal prep, combine everything but the avocado and dressing. Add those before serving to prevent brown avocados and soggy salad. Combine all dressing ingredients in shaker or jar with lid. Shake until mixture is completely blended. Prepare all salad ingredients in serving dish. *My preferred method: Preheat oven to 450ºF. Coat chicken breasts with olive oil, salt and pepper then transfer to a roasting dish. Roast for 25-30 minutes or until 165ºF internal temperature. (time will vary depending on thickness of chicken) Let cool then slice. Add-Ins: Bacon, Onion, Celery, Cabbage, etc. **This recipe makes enough to dress this salad. For extra dressing or if you prefer heavy dressing, double recipe. Oh, I had a chicken salad yesterday and was craving honey mustard dressing. Perfect timing–this was so easy to put together and tasted incredible! Gorgeous pictures by the way!